Join Egon, Venkman, Ray and Winston as they bring in a new recruit to the Ghostbuster Crew… That you by the way – the new recruit known as the “rookie”. Travel to many of New Yorks finer establishments in your pursuit of Gozer and the oculist that are trying to bring forth “the destructor” all the while trapping ghosts, blasting animated statues and melting a ton of marshmallow (man). 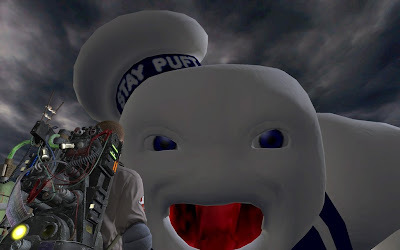 That’s right Mr. Stay Puft is back and he is not very happy after his last visit with the Ghostbusters. Having grown up with the Ghostbusters I was really looking forward to this game, and I was not disappointed. From the first mission strapping on my proton pack, being warned about the streams and the introduction to the trapping systems I was hooked. The voice acting, the game play, the story all stuck true to the moves of my childhood. My only major beef with this game was the time to finish the game I was finished in less then 10 hours (I almost consider this a mandatory time limit for games now) and it felt like a rather abrupt ending. It’s not often when a movie franchise successfully makes the jump from the big screen to your console, especially with out an accompanying movie release, but I feel the Ghostbusters were successful here. Bringing back all the original actors to voice their characters as well as a number of the supporting characters. Sticking true to the original movies Dan Aykroyd and Harold Ramis assisted in the writing of the games storyline giving it that true Ghostbusters feel. Single player gameplay is your typical third person shooter, but with a pack shooting accelerated particles instead of bullets. Your standard proton stream is your primary weapon, but you’ll receive and purchase useful upgrades as you progress throughout the game. Things like the Stasis Stream, the Meson Collider and the Slime Blower will become available to you, along with upgrades to deal with overheating and trap advancements. You will easily be able to purchase all of these well before making your way to the final level of the game, you will also have plenty of money left to spare in the end. During the course of the game you’ll make plenty of use of your PKE Meter to identify precious spiritual artifacts, hidden objects and build your ghost database – pay attention to this as it will help you identify the weaknesses of your enemies. Multiplayer is online only – no local multi-player – and takes the form of a Hoard mode style ghost hunt. The clock ticks down as you and three other players fight and trap ghosts or defend precious artifacts. This is a good way to extend the life of the game but gets old quickly. Maybe some DLC will give some new life to this portion of the Ghostbusters the game. Graphically you will recognize the streets and locations of New York City, from the Library to Sedgewick Hotel and even central park. Making good use of the enviromnes your find transitions between indoors and outdoors are flawless and require no load time. Cut scenes are full of humour and information on what to expect next and how to use your newly acquires upgrades. Even though I enjoyed this title the length of the game play makes me say – this is a rental for most people, unless you can find it on sale for under $40. Feed Your Console gives Ghostbusters a 7.5 out of 10.